The genus name Phalaenopsis is from two Greek words : "Phalaena" and "Opsis", meaning "moth-likeness". The type-species of the genus is Phalaenopsis amabilis, described by Blume in 1825. Phalaenopsis are native to Southeast Asia, India, Indonesia, Malaysia, the Philippines and Northern Australia. Most Phalaenopsis are epiphytes, meaning they grow in trees, but a few are lithophytes, meaning they attach themselves to the surface of rocks. A Phalaenopsis species is a Phalaenopsis found in the wild in its native habitat. 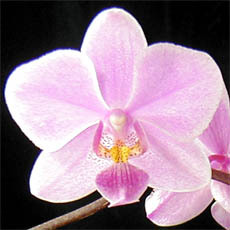 A Phalaenopsis primary hybrid is the result of crossing two Phalaenopsis species. To add a bit of confusion, some Phalaenopsis primary hybrids occur naturally. 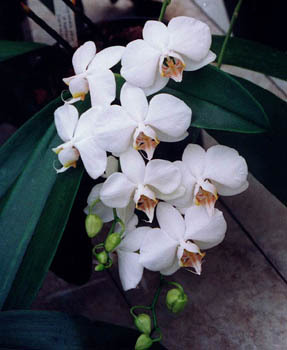 Note that these hybrids are identified by preceding their names with the letter "x"
For example : Phalaenopsis x Veitchiana is the result of a natural cross between Phalaenopsis equestris and Phalaenopsis schilleriana..